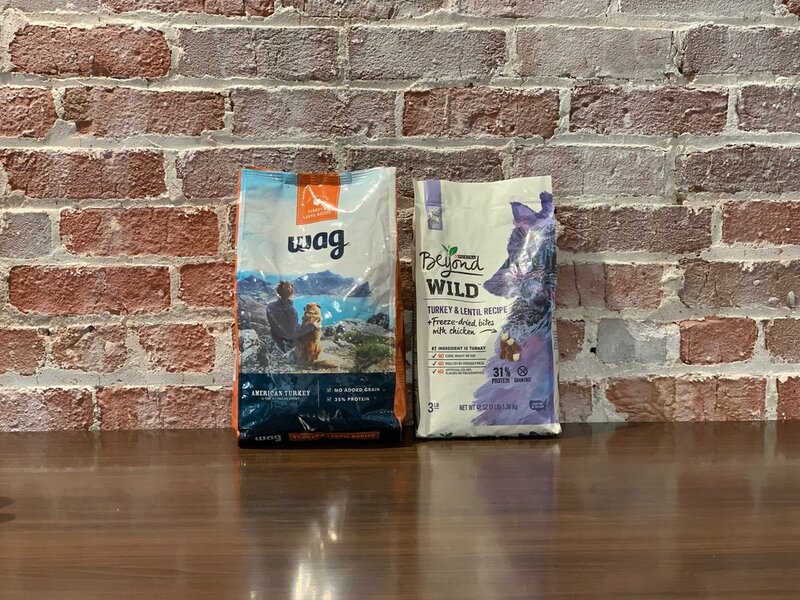 Amazon’s private label, Wag, has garnered plenty of attention. The price is right, it’s marketed with buzz words people love like “grain free,” “meat from the US” and “all natural” but Brandefy wanted to know more about these foods before making any recommendations. I surveyed pet owners to see what they cared about. Overall, they cared about the ingredients and nutrition, but also wanted it at a fair price. As a pet owner myself, I totally agreed with that! I started by calling the manufacturers. Purina Beyond got me to a live person almost immediately and they were able to confirm that all ingredients were sourced and produced in the US. I had to call two different numbers and try an email to the Wag people. They only told me that their meat came from the US, but could not confirm the countries where the other ingredients came from. They did confirm that all meat came from the US. I did a lot of online research on the ingredients and what they’re purpose was for. I learned that Wag has several ingredients that are supposed to help with the dog’s stool. If your dog is like mine, he needs no help going poo multiple times a day! We also consulted dogfoodadvisor.com and compared their ratings on the different foods. They use a slightly different rating system from us, but we like their breakdown and suggest you check it out! Then, we put the food to the doggy sniff and choose test, and also watched our dogs to see how the food affected them. See our findings here.